Notably, the Congress in its manifesto for Lok Sabha Elections 2019 has promised to remove the sedition law to give a ‘fillip to freedom of expression’in the country. Shiv Sena chief Uddhav Thackeray and Congress president Rahul Gandhi. 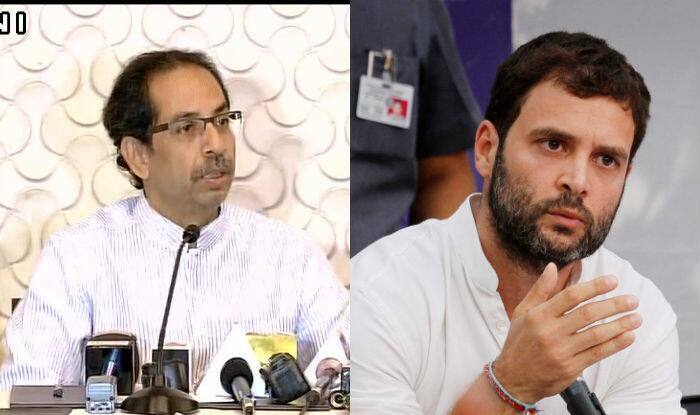 Mumbai: Shiv Sena chief Uddhav Thackeray on Tuesday termed Congress president Rahul Gandhi ‘unworthy’ of becoming the prime minister while hitting out at him for promising to abolish sedition law. This is not the first time that the Sena chief had made an apparent attack at the Congress over its poll promise to abolish sedition law. Earlier on April 8, the Sena chief, while addressing an election rally at Kalmeshwar in support of Shiv Sena’s Ramtek constituency candidate Krupal Tumane, had said, ‘If Rahul Gandhi thinks he will come to power by supporting traitors, we will not let it happen.” Further, he asked the public, ‘Do you agree with this? (Congress manifesto)…’ while adding that ‘Anyone who commits treason should be hanged’. Notably, the Congress party in its manifesto has promised to remove the sedition law to give a ‘fillip to freedom of expression’in the country. “Omit Section 124A of the IPC (that defines the offence of ‘sedition’) that has been misused and, in any event has become redundant because of subsequent laws”, the manifesto says. Meanwhile, the Sena chief also asked Opposition parties to announce their PM candidate. “The BJP, Shiv Sena and the Republican Party of India (RPI) have come together on one ideology for the love of the nation. But, I want to ask why have Maha Aghadi come together who have conflicts between them. Who are these people? Our dream is for the country, what about you? Your dream is only power. Our prime minister will be Narendra Modi tomorrow also. And I want to ask the opposition to announce one name for the PM’s post,” he had said.